Our Sassy Green Tea with Acai combines top-quality green tea with peach, ginger, acai, and orange for a sweet and subtle spice. This is really good! I love the sweet and spicy in this cup – the sweet is just a little stronger than the spicy, and they enhance each other very well. It is really quite a palate pleaser! That being said, I’m finding it a little difficult to discern the different fruits and spices being represented here. They seem to merge very well – almost too well – so I can only taste wee little notes of each ingredient. I can taste a sweet smoothness brought on by the peach flavor, along with a delicate note of orange. There is a light tartness from the açaí berry. A subtle warmth comes through from the cloves and the ginger, and just at the end of the sip, the chili sort of SNAPS on the tongue, it isn’t really powerful or overwhelming… but it does let you know it’s there. 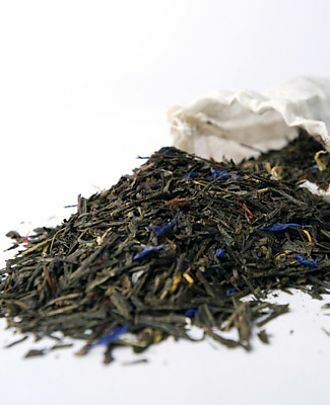 It’s really quite an enchanting blend – and I can see why Village Tea calls this their Sassy Green Tea!